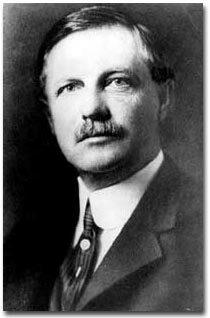 1893 - Frederick Jackson Turner presented his essay, “The Significance of the Frontier in American History,” to a meeting of the American Historical Association at the Chicago World’s Fair. Turner claimed that the frontier had created the special American character. The closing of the frontier indicated that the first chapter in American history had also ended. Turner believed in “American Exceptionalism”—the idea that America was special because of its special circumstances. Turner used maps to depict data and understand American history throughout his long career. 1901 - Turner attacked immigration from Southern and Eastern Europe. Frederick Jackson Turner. Courtesy of the Library of Congress.